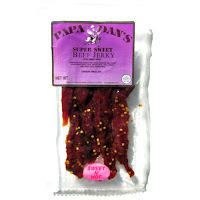 Next in the series on Papa Dan's Beef Jerky is this Sweet N' Hot variety. See my previous reviews of their Old Fashioned, Ring of Fire, and Carne Asada varieties. 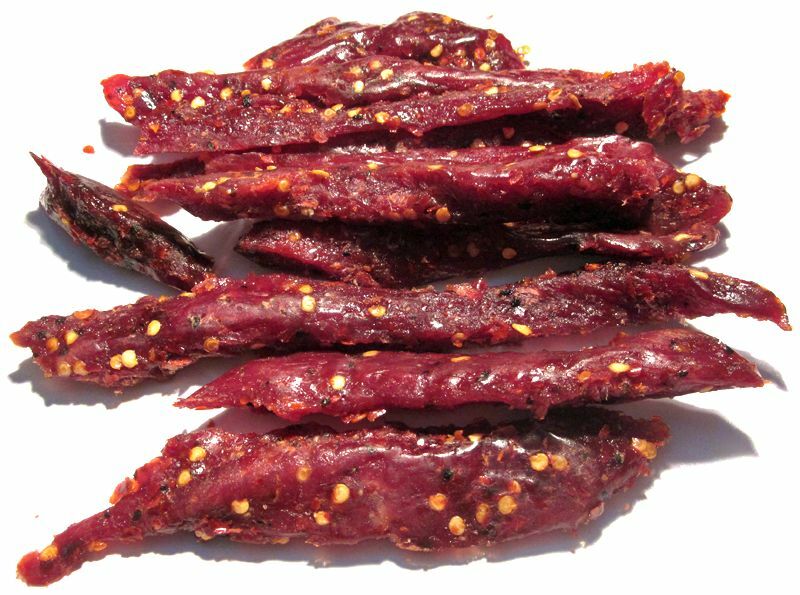 From what I can tell, this Sweet N' Hot variety appears to be Papa Dan's "Super Sweet" beef jerky, but with chile pepper flakes added. Beef, brown sugar, water, seasoning (salt, sugar, brown sugar, maple sugar, sodium nitrite (.0084), vinegar, liquid smoke, sodium nitrite. The first thing I taste from the surface of these pieces is a heavy sweetness, followed by a light chile pepper flavor, and a light bit of saltiness. There's a burn building up quickly. The chewing flavor starts with an increased sweetness, a light natural meat flavor, a wee bit of black pepper, and then a bit more saltiness. The chile pepper flavor continues about the same, while the burn seems to have leveled out. For being labeled as "Sweet N' Hot", this seems to stand up to that description. It's very sweet, being the first thing I taste from the surface and lasting all throughout the chewing. There's also a good deal of heat in this, registering a "medium hot" (level 4 out of 5) on my personal heat scale. 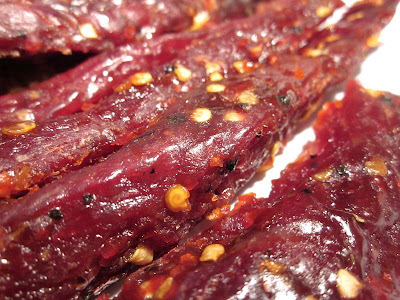 The sweetness is definitely the dominant flavor in this jerky. It goes all the way into the meat itself. It's like meat candy, as if someone poured melted sugar all over my jerky, and let it marinate for a full 24 hours. The natural meat flavors are noticeable to a light degree, it's just enough to add a bit of flavor to the sugar. It doesn't really taste like steak however. I'm wondering if the heavy sweet marinade has changed the chemistry of the meat flavors. It has almost like a bread-like flavor, kinda like where breading was added to meat loaf. The chile pepper seasoning definitely does have a noticeable impact flavor in this, giving me that unique flavor of chiles, but also the heat. I can feel that capsaicin rush going through my bloodstream. The saltiness in this feels to be at a light to medium level. I'm sure the heavier sweet has mitigated much of it. Overall, what you're going to notice in this Sweet N' Hot variety is a ton of sweet, with a noticeable chile pepper flavor, and a good deal of heat. There's just a light bit of natural meat flavor, and even a light but noticeable black pepper. These are slices of whole meat, sliced into thick strips and chunks, ranging from two to seven inches in length. This is a dry jerky, with a sticky surface feel. These strips have some flexibility, but will crack apart if bent far enough. Biting off chunks seems easy to do, while chewing seems somewhat easy. The chewing texture starts out feeling moist and soft. It doesn't take much chewing or effort to get a piece to break apart and chew down to a soft mass. At that point, it has a meaty feel, but not really like a steak. The fibers don't mesh, more like chewing a dry meat loaf. I don't see any bits or streaks of fat on these strips. I didn't encounter any gristle or tendon, nor did I find any stringiness, and nothing unchewable. It's all very meaty. Handling these strips leaves a good deal of sticky residue on my fingers with some chile pepper flakes stuck on, requiring a licking and wiping before touching my keyboard. Papa Dan's sells this Sweet N' Hot variety from its website at a price of $23.99 for two 8oz packages. Add to that $7.56 for shipping to Southern California, and it totals out to $31.55. That's works out to be $1.97 per ounce. As a Sweet N' Hot variety at the same $1.97 per ounce price, it's also a good value. I'm getting lot of sweet and a good deal of heat, as well as some chile pepper flavor too, more so than many other Sweet and Hot or Sweet and Spicy brands. This Sweet N' Hot variety from Papa Dan's Beef Jerky stands up to its advertised flavor pretty well, dishing out a lot of sweet with a medium-hot level of heat. It's probably one of the most heavily sweetened jerkies I've had thus far, with the sugary marinade going deep into the meat fibers. 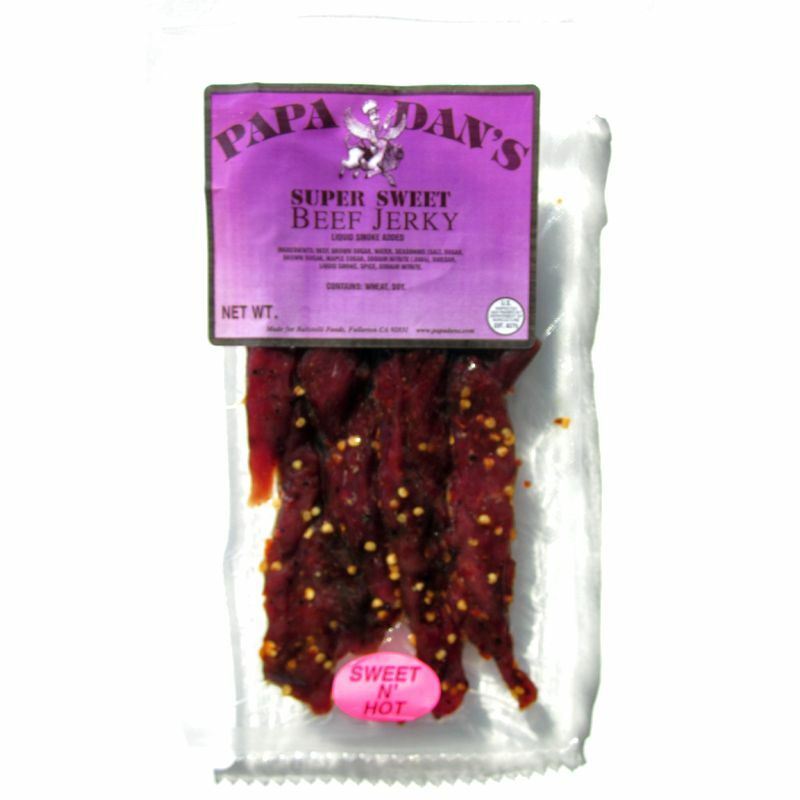 In fact this variety is actually Papa Dan's "Super Sweet" beef jerky, but with a sticker added that says "Sweet N' Hot", as if they just added the chile pepper seasoning to it. But it manages to effect a good deal of spiciness from that chile pepper as well as black pepper. I didn't care much for the natural meat flavors in this. It has a strange flavor, perhaps the heavier sugar marinade has changed the chemistry of the meat, making it taste something like meat loaf with breading mixed in. And the chewing texture tends to feel similar, like a drier meat loaf, where the meat fibers don't mesh together, and take on a slightly mushy feel. But I still found a good deal of snackability in this for its easy eating and unobstructed chewing. I'm also a chile pepper lover and enjoyed the flavor of chiles in this. My recommended beer pairing for this, go with something light in flavor and refreshing to counter that heavy sweet and burn. Try a Sierra Nevada Pale Ale or the Anchor Steam.